Robert Greer served with the Royal Marines during World War Two. He died off the coast of Belgium on 2nd November 1944 during the Battle of Walcheren. Robert Greer received a promotion to Temporary Sergeant as a Royal Marine Commando before his death during the Battle of Walcheren in 1944. Sergeant Robert Greer (CH/X 3121) served as a Royal Marines Commando during World War Two. Born on 12th December 1907 at 15 Dagmar Street, Belfast, Co. Antrim, he was the son of Robert Greer and Mary Jane Greer (née Moorhead). His father died on 20th November 1909 when Robert was 1 year old. The 1911 Irish census lists Robert living with his mother and older sister Eileen Elizabeth Greer at 7 Dagmar Street, Belfast, Co. Antrim. The family’s given religion is Church of Ireland. Mary Jane at this point works as a Theatre Attendant. Eileen died in 1915 aged 8 years old. Also in 1915, a motor car struck Robert Greer as he crossed the road at Peter’s Hill, Belfast, Co. Antrim. He sustained serious head injuries and an ambulance transported him to the Royal Victoria Hospital. Imperial War Museum Photo: IWM (A 26260) (Part of the Admiralty Official Collection). 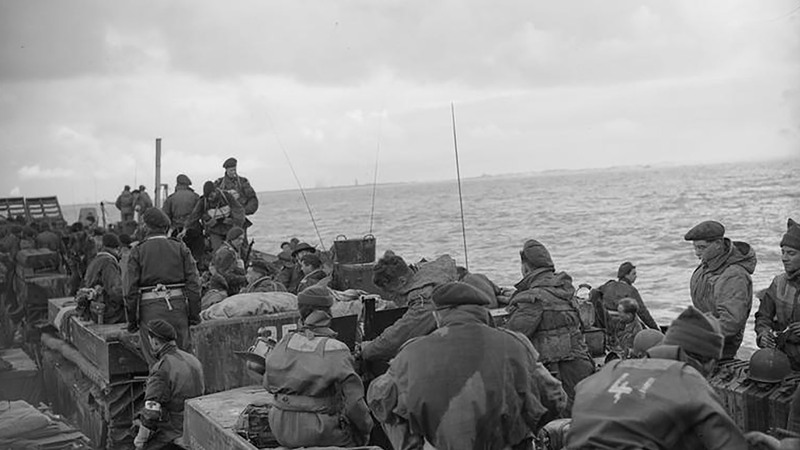 Royal Marine Commandos in Alligators and Weasels nearing the landing beach in a Landing Craft Tank during the landing on the island of Walcheren at Westkapelle during the final phase of Operation Infatuate. Copyright Lieutenant MHA McNeill - Official Royal Navy Photographer. On 12th September 1931, Robert married Margherita Guiseppa Carla Maria Joanna Whitworth, who was born in Senglea, Malta. The ceremony took place in St. Michael’s Roman Catholic Church, Chatham, Kent. Greer had already enlisted in the Royal Marines by this time and his new wife was a hotel chambermaid. Greer lived at Navy House, Clover Street, Chatham, Kent. The 1939 England and Wales Register shows Robert as a Royal Marine living with his wife. She is an unpaid domestic servant. The couple lives with their 3 children at 252 Pier Road, Gillingham, Kent. The Belfast-born Marine died on 2nd November 1944 in Westkapelle, Belgium aged 36 years old. Richard Blyth, who served alongside Robert Greer, relayed the story of his last mission. During the Allied advances through Europe, Greer had received a promotion to Temporary Sergeant. Support Squadron Eastern Flank (SSEF) Force set sail from the south of England on 27th October 1944. The force consisted of 6 large Landing Craft Guns, 2 medium Landing Craft Guns, 6 Landing Craft Flaks, 6 Landing Craft Supports, and 5 rocket craft. This flotilla of 25 vessels sailed with a small fleet of other ships including Landing Craft Infantry and Landing Craft Tank. The first destination was Oostende, Belgium. At 0325hrs on 1st November 1944, SSEF Force left Oostende. The fleet brought Royal Marine Commandos, second wave troops, and amphibious vehicles into battle. In the early hours of the morning, Westkapelle came under attack as part of Operation Infatuate. The aim was to secure the port of Antwerp for Allied use as a supply route through Europe. The Allied attack came at 0915hrs in broad daylight. The weather conditions were poor with visibility reduced. A support squadron and spotter planes from the Royal Air Force could not take to the air. Off the coast, HMS Warspite, HMS Erebus, and HMS Roberts fired towards Nazi gun emplacements. The fog was so thick, they could not see the results. The plan was for the SSEF Force to split into two equal groups. One would go north of the gap and the other would head south. The 2 largest Landing Craft Guns engaged the Westkapelle Battery as the German guns returned heavy fire. The vessels drew heavy fire from the Nazi batteries. They returned fire from 4-7″ guns as the Landing Craft Tanks unleashed 6″ rockets. Each of the 4 LCTs had 1080 such rockets capable of causing severe damage. Enemy fire intensified as the landing craft carrying the Royal Marine commandos made their way closer to the dyke. Soon, the two large Landing Craft Guns engaged the batteries at almost point blank range. HMLCG (M) 102 beached to the south of the dyke, continuing to engage an enemy pillbox with its 3″ guns. German guns returned a hail of shells, setting the craft on fire. The LCG broke up and burned out on the beach. There were no survivors. Imperial War Museum Photo: IWM (A 26238) (Part of the Admiralty Official Collection). 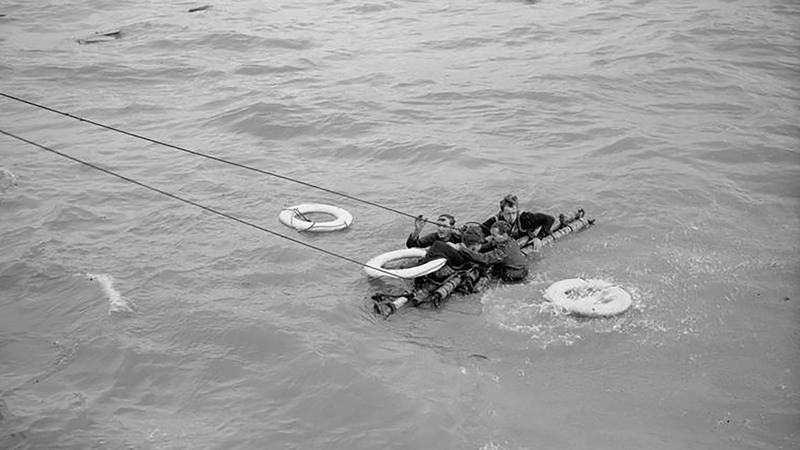 Survivors of a destroyed Landing Craft Gun vessel cling to a rescue raft at Westkapelle during the final phase of Operation Infatuate. Copyright Lieutenant RGG Coote - Official Royal Navy Photographer. Meanwhile, Robert Greer’s ship closed in to within 600 yards on the northern side of the dyke. The vessel took the brunt of several big hits from shells before one struck the bridge with devastating consequences. With equipment destroyed, and all officers injured, Landing Craft Gun (L) 1 drew to a halt. There were 20 injured and 2 dead. Fellow Marine Robert Clark (CH/X 111645) died alongside Belfast-born Robert Greer. Landing Craft Support 510 picked up the survivors from HMLCG (L) 1. The skipper of HMLCG (L) 17 attempted to tow the stricken craft but it sank and skipper Lieutenant Scammell received fatal wounds in the process. The Royal Navy lost a total of 9 of the 25 vessels in SSEF Force. A further 9 sustained damage and during the battle, 172 officers and men lost their lives. Robert Greer’s grave is in Plot 9, Row 6, Grave 33 of Oostende New Communal Cemetery, West-Vlaanderen, Belgium. If you enjoyed this post on "Robert Greer", please share with your friends and followers.